Click for a PDF version. The Pacific Northwest Regional Council of Carpenters, the union body that represents over 20,000 carpenters and other construction workers in six states from Alaska to Wyoming, adopted this resolution at its February 2017 delegates meeting. 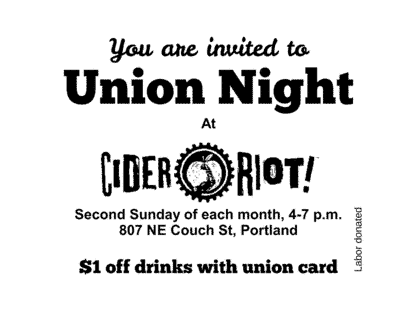 This follows the adoption of similar resolutions, first in Painters Local 10 of Portland, Oregon, and later by Stagehands, Carpenters, graduate teaching assistants and Wobblies in Oregon and Washington. In April, a similar motion was adopted by the Oregon state convention of the American Federation of Teachers (AFT) and by Portland Laborers Local 483. Labor militants in the UBC and elsewhere should use these resolutions to make preparations for union-based marshals and defense guards that will form the core of mass labor-centered mobilizations that can prevent fascist provocations and organizing in urban centers. Therefore be it resolved that the Pacific Northwest Regional Council of Carpenters stands ready to join with the broader labor and social justice community in mobilizing against the clear and present danger that the provocations of racist and fascist organizations pose to us all. Luego de la victoria del republicano racista, xenófobo y misógino Donald Trump sobre la demócrata guerrerista y representante de Wall Street en las elecciones presidenciales en Estados Unidos del 8 de noviembre, los fascistas encapuchados del Ku Klux Klan anunciaron que organizarían mítines para celebrar su “triunfo”. De conocer rumores que uno de esas provocaciones se llevaría a cabo en la cercanía de Portland, Oregon, el Local 10 del Sindicato de Pintores y Drywaleros (IUPAT) aprobó una moción llamando a una movilización obrera para parar en seco los linchadores del KKK y otras fuerzas racistas. La resolución (que reproducimos a continuación) fue iniciada por militantes de CSWP (Trabajadores de Lucha Clasista de Portland). Los sindicatos locales de Carpinteros (local 1503), Tramoyistas (local 28), Estudiantes-profesores de posgrado de la Universidad de Oregon (AFT local 3544), así como el consejo regional de Carpinteros del noroeste, luego aprobaron resoluciones parecidas. ¡Movilización de los trabajadores para parar al KKK! Considerando que los sindicatos son tenidos como una amenaza por el KKK y otras organizaciones racistas debido a que son una organización de defensa de la clase obrera para todos los trabajadores en la comunidad. Resolvemos que el Local 10 del Sindicato de Pintores y Gremios Conexos (International Union of Painters and Allied Trades) está listo para unirse a la comunidad para movilizarse en contra del claro y presente peligro de las provocaciones del KKK y otras organizaciones racistas representan para todos nosotros. Carpenters Local 1503, IATSE (Stagehands) Local 28, and the Seattle branch of the Industrial Workers of the World (IWW) have recently joined the preparations to stop fascist provocations by passing resolutions similar to the Portland Painters Local 10 anti-KKK mobilization resolution. What is needed now is the preparatory organization of union-based defense groups, to form the core of mass mobilizations to deny the fascists the ability to agitate and recruit in multiracial urban strongholds of the working class.